Our top selling tea infuser, this 16oz glass and metal bottle is perfect for your ‘on-the-go’, hot or cold tea. 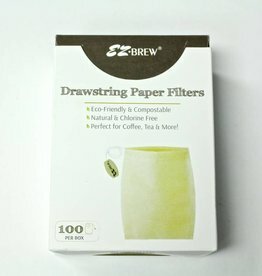 Eco friendly, hard to find drawstring paper filter tea bags. Compostable, chlorine free. If you’re pregnant you’ve likely heard of the benefits of raspberry leaf tea in prepping the body for delivery. If you’re not, it’s still a lovely cup, chock full of vitamins and minerals to enjoy. Organic valerian root, chamomile, lemon balm, lavender and passion flower are all traditional herbs known to promote relaxation and dare we say it … a good night’s sleep! Sweet dreams…. A zesty organic turmeric chai blend of organic Assam tea with a perfect mix of cinnamon, ginger, turmeric root, cardamom, and black and pink pepper corns to help energize your day. If your monkey mind just won't settle and let you drift off we’ve got just the ticket with this creamy orange dream of a tea. This stainless steel tea tumbler is the perfect container to take tea on any adventure! Its double-walled insulation will keep tea iced or hot for hours. The ultra-fine stainless steel filter is suitable for loose leaf tea leaves of all sizes. Fight the flash with these herbs that have traditionally been used to reduce menopause symptoms.